Now the that Grand Prix is over the next phase is to get back to training for marathons or at least that's the plan. But before that starts I had something else I wanted to do. 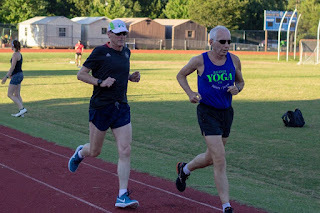 Two summers ago when I was focused on trying to get my mile time down to what I ran in 1999 I had wanted to use that speed and try to run a fast time in a track 5k. There just aren;t that many opportunities to do that other than the Wednesday night Godiva track meets and the schedule of nights that had that distance just never worked out for me. So, I was happy to see that the first week of the Summer of Miles Podcast pop up mile series which is put on by the Sir Walter Miler folks would have a 5k as the bonus event. Speed wise I'm not close to what I was two years ago and really haven't done the speedwork at the paces that I need to do for my goal but I figured it would still be fun and I could try and give it my best shot. 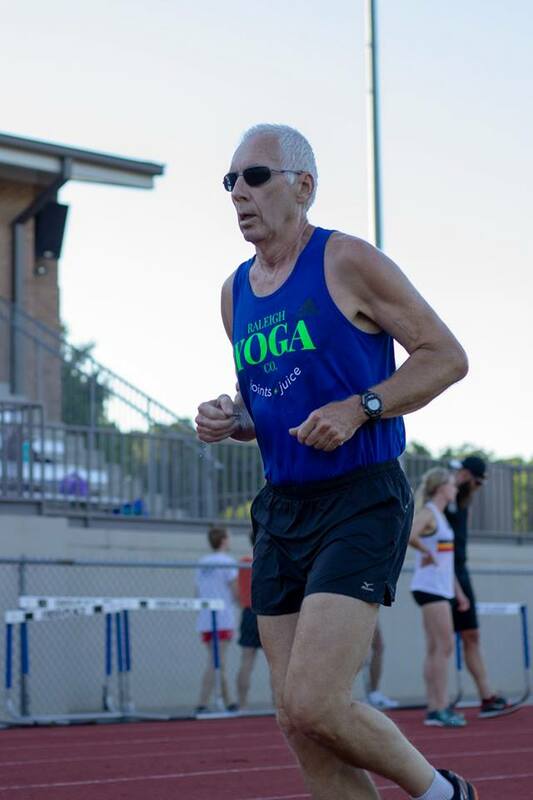 I haven't run a sub 22 5k in 5 years when I did it 3 times in a row in summer of 2013. I seriously doubted that I would be able to this night but all I could do was go for it and see what would happen. Sometimes miracles do occur. The meet was held at the beautiful Cary Academy Campus and I arrived in plenty of time for socializing and a proper warmup. 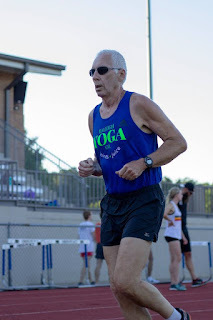 There would be 90 plus runners for all the events combined and a lot of family and friends spectating and it was great to see so many that I knew along with a few former co-workers from the running store days. We were lucky with the weather as there was lower humidity than normal and by the time the 5k started , half the track was in the shade. 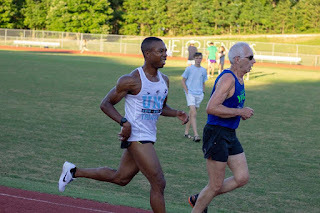 I didn't feel too spiffy in my warm up but with 5 minutes to go as I was doing the usual 4 x 10 second strides, on the last two I felt a little zip in the legs. Maybe this was going to be ok. I guess there were 20-25 runners in the 5k and I tucked in behind the faster younger runners. 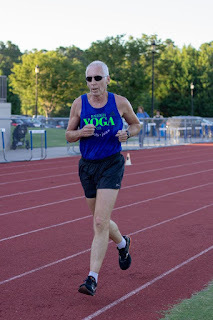 As far as I know there was only one other senior in the race and from the word go he was on my heels. My goal pace was about 1:46 per quarter mile and I nailed the first one but by the half I had dropped off that pace to 1:50 and thats about what I would run for the remainder of the race. The coolest thing was having so many people call me out by name and cheer for me each lap as I came around to the front stretch. 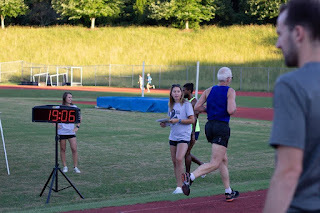 George, the other senior was right there for the first mile which I passed in about 7:15 but he was slowly falling behind now and by half way I couldn't hear him anymore. I was feeling good and locked into the pace now and slowed down a bit in mile 2 to about a 7:25, or 14:40 for 2 miles. Now it was just dig deep and try to pick it up a bit the last mile. Of course it was getting harder to hold pace but I pushed on knowing I could endure the pain a bit longer. With half mile to go I was making the death noises. I ran the last 800 meters in 3:34 and finished strong in 22:39 which tied my fastest 5k since 2013. I ran that exact same time at the Foot Locker XC Regional year before last. 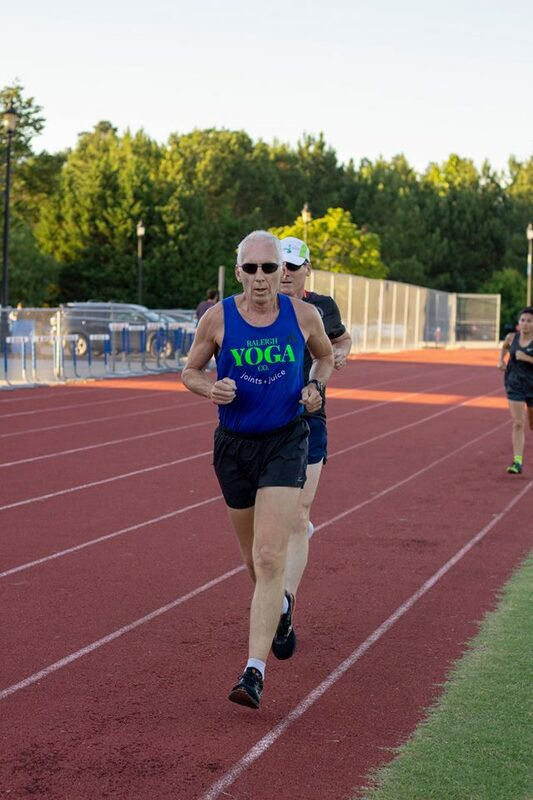 representing Raleigh Yoga Company ! was a fun night of racing and spectating and I appreciate all of the people from Sir Walter Miler for putting this series on for the local running community. And thanks to Jason Honeycutt for taking over 500 photographs and posting them publicly for us to share. I think there was at least 15 or more with me in them but I chose these because they make me look halfway decent !